At HSS we are always looking at innovative ways to enhance and improve our product offering and on ways for our customers to engage seamlessly and efficiently with our company. 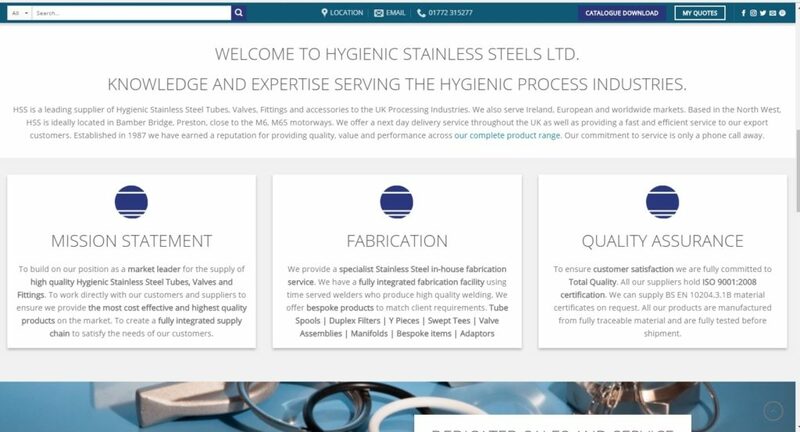 We have listened to our customers and the requirements of the Hygienic Process Industry and the team at HSS has developed an innovative, streamed lined web hub which allows our customers and indeed potential clients to easily find our products and technical data. It further allows our customers to review products which suit their requirements and submit enquires 24/7 365 days a year. Our new web hub is built using a market leading content management system. It is fully optimised for standard desktops, laptops and mobile devices allowing visitors an enjoyable experience. We have also launched our brand new brochure, in which you can find all our latest updates and product offerings. The brochure represents months of hard work by the team at HSS. Why not sign up for our new monthly newsletter which will contain product profiles, product focus, case studies, technical articles and latest changes in our market? If you have any comments, suggestions or questions, please do not hesitate to get in touch with the team at HSS. Enjoy our New Website and we look forward to discussing your future Hygienic Stainless Steel requirements.